Still trying to find our summer groove. The kiddos are finishing up some summer camps this week, then they are free as jaybirds the rest of June. 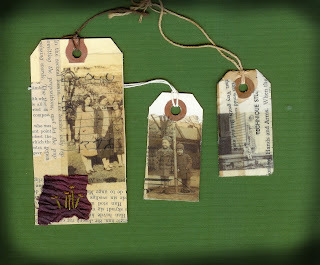 In the evenings I've been working some more with transfers and collage, looking for some unusual places to put them...last night it was recycled tags. Angie, your tags are wonderful, I love the old images, and and seoia look. Wish you a wonderful june.